Here are some of my favorite comics read in 2018. They may or may not have been published this year. Also, a few have more than one volume and I have not designated a particular volume if I would recommend the whole series. My picks are listed in alphabetical (rather than rank) order. Dig it, Stranger Things meets The Usual Supects! Four misfit kids try to help out one of their number’s father. He is being forced into pulling a bank heist with his recently released former partners in crime. 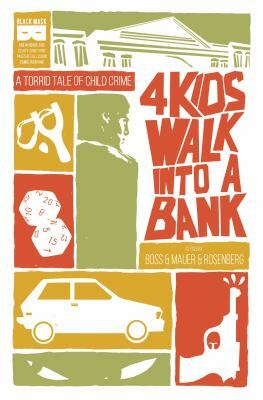 The four plan to pull the heist off first so that he won’t have to do it…and then all hell breaks loose. 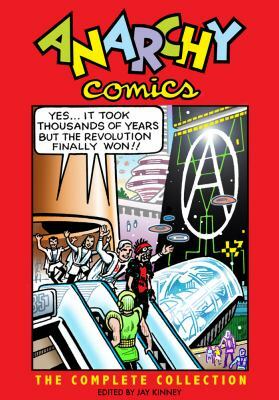 Exactly what it says, man…comics about Anarchy! Or rather Anarchism, both historical and speculative. 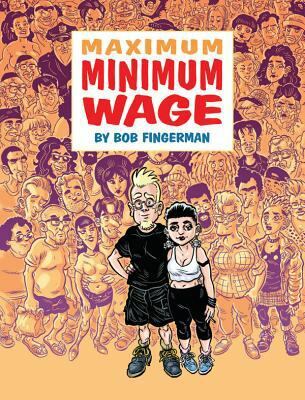 This classic Underground Comix has finally been given the omnibus treatment it deserves. Best thing ever! 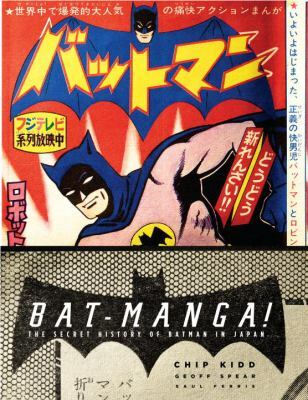 The entire run of the 1960’s manga version of Batman, organized by graphic designer extraordinare Chip Kidd. Thrill to these far-out tales, especially as the Caped Crusader faces down the infamous Lord Death Man! 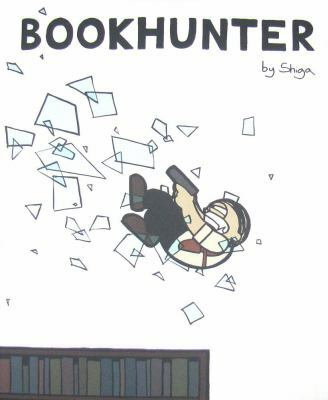 Don’t try to steal that book or stiff the library on money you owe or else the intrepid Bookhunters squad will hunt you down! Set in Oakland, CA, in 1973, Shiga’s Library Police take us on a thrill a minute adventure. Meet Lance Pertwillaby as he he gains super-powers and embarks on crazy adventures, such as battling a Godzilla-sized J. Fred Frog threatening to destroy downtown Louisville. 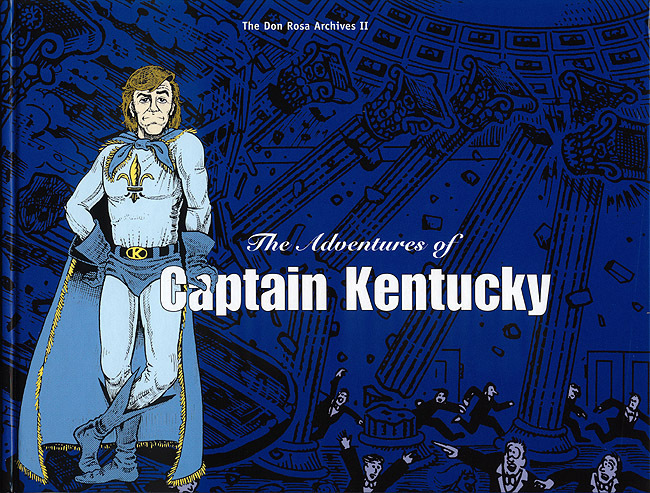 This volume collects local cartooning legend Don Rosa’s comic strips which ran in the Louisville Times back in the day. 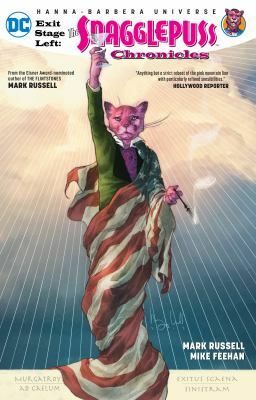 It’s 1953 and Snagglepuss is a renowned playwright who gets called before the House Un-American Activities Committee (H.U.A.C.). At the same time, long-term friend Huckleberry Hound has been found in a compromising situation that has ruined the fellow playwright’s career. Snagglepuss’ testimony will help make Huckleberry Hound’s problems go away but will he sacrifice his artistic integrity? Loser tries to kill himself but manages to survive…thanks to a DEMON! All he has to do in exchange is kill one bad person a month. Or could it be his mental illness manifesting now that he stopped taking his meds? 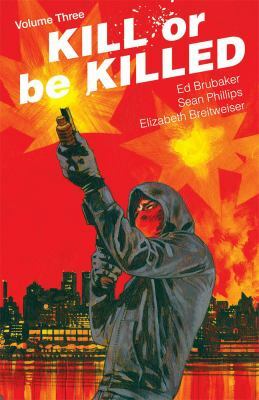 Author Ed Brubaker and artist Sean Phillips once again collaborate, this time on a psychological crime comic. You won’t be able to stop turning pages till the end! Classic Gen-X comic about the struggles of a cartoonist and his hothead girlfriend as they try to get by in New York. Will they find the job of their dreams? Will they even be able to pay rent? One man’s fight to survive the revenge attempts of his undead and supernatural foes. Crazy awesome detailed art from Geof Darrow is worth the price of admission alone! Restin Dane is the Master of Time. 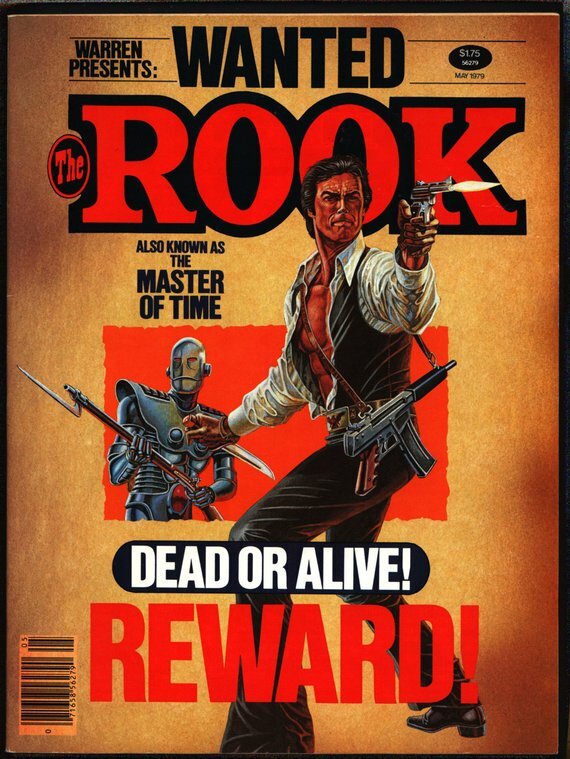 Follow him, his faithful android man-servant Manners, and his cranky outlaw grand-pappy Bishop Dane, as they travel through time battling the forces of evil. All of these works can be checked out from LFPL. Each title has a “Check Our Catalog” link that will take you to where you can view the location and status of the specific item in our system. After taking a look, if your selection is not available at the branch you wish to go to, you may have the item shipped there by placing a hold request (using the “Place Request” button on the right hand side of the item’s catalog entry). If you are interested in discussing these titles or other works of sequential art, please join LFPL’s Graphic Novel Discussion Group. Meetings are held at the Main Library on the second Monday of every month, starting at 6:00 PM. Our next meeting is this upcoming Monday, December 10, 2018. 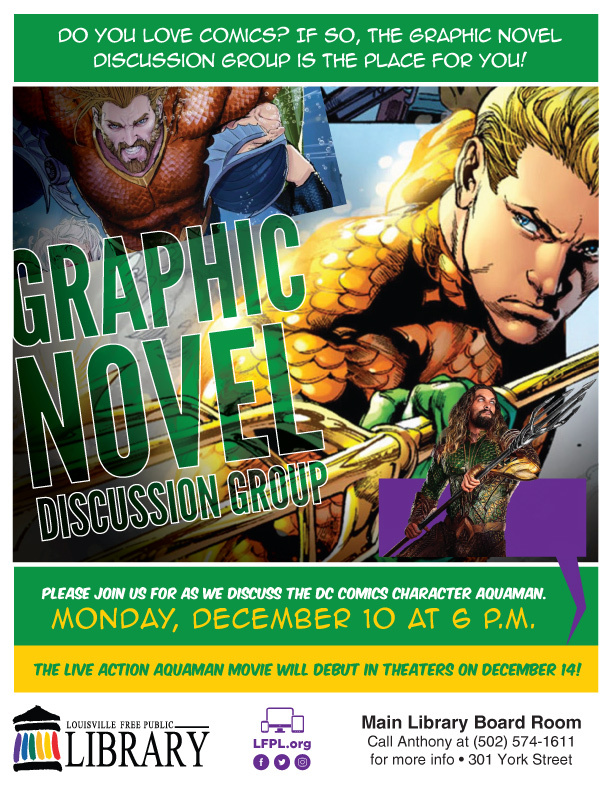 We will be discussing DC’s Aquaman. 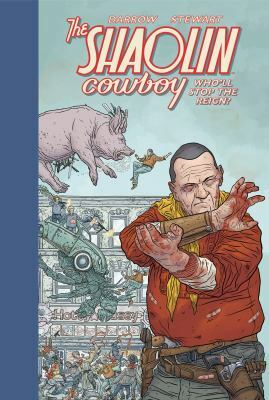 This entry was posted in Library Programs, Reviews and tagged Comics, Graphic Novel Discussion Group, Graphic Novels, Sequential Art on December 5, 2018 by Tony.